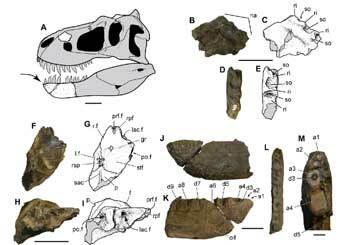 At a quarry on Alaska’s North Slope, scientists have found the fossil skull of an unusual new type of Arctic tyrannosaur. But this is no T. rex. At 70 million years old, the newfound dino predated the Tyrant King by some 5 million years. 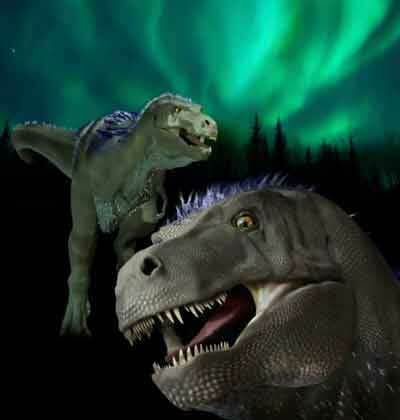 Perhaps more important, the giant T. rex probably wouldn’t have fared well so far north; its ancestral “northern cousin,” however, appears to have been well adapted to life in the Arctic. Scientists first thought the bones — including a partial cranium, jaw, and several teeth — were those of a Gorgosaurus, and then an Albertosaurus, both types of lighter, long-nosed meat-eaters whose fossils have been found from Montana to Alaska. But even though the new specimen was fully grown, it was surprisingly diminutive, its skull measuring only 60 centimeters, the animal itself probably no more than six meters long. Led by Anthony Fiorillo of Dallas’ Perot Museum of Nature and Science, the team named the resilient new genus Nanuqsaurus —after nanuq, the Inupiaq word for polar bear. Its discovery stands to broaden our understanding of tyrannosaurines, the paleontologists say, in part because most of what we know about them comes from fossils found at much lower latitudes, like southern Canada and central Asia. But Nanuqsaurus also promises to provide an object lesson in dinosaur diversity and evolution. Although the ancient Arctic was warmer than it is today, it was still home to “extreme seasonal changes,” Fiorillo’s team says, particularly when it came to the availability of sunlight. Long Alaskan winters with little light not only limited the leafy growth that tyrannosaurs’ prey, like ceratopsids, fed on, the darkness also just made hunting harder. The fossil record shows that some predatory dinosaurs found ways to thrive: Alaskan specimens of the small theropod Troodon, for example, were actually larger than those that lived farther south, because, scientists suspect, their enormous eyes made them especially well-suited to low-light hunting. In the case of Nanuqsaurus, Fiorillo’s team says, the evolutionary response seems to have been to do more with less. “The smaller body size of Nanuqsaurus … may reflect that in the profoundly seasonal ancient Arctic environment, where the widely varying light regime affected biological productivity, resource availability was limited,” the team writes, in the open-access online journal PLoS One. “The ‘pygmy tyrannosaur’ alone is really cool because it tells us something about what the environment was like in the ancient Arctic,” Fiorillo said in a statement.